The next time you happen to be in Paris and have a spare moment you might wander over to, or even up, the Eiffel Tower. The exercise will do you good, assuming you don’t have a heart attack, and you can extend your knowledge of science by scanning the names of 72 French scientists that you’ll find beneath the square thing that looks like a 1st floor balcony. Chances are you won’t recognize any of them: they really are History Boys – only two were still alive when Gustave Eiffel’s exhibit was opened for the 1889 World’s Fair. One of the army of unknowns is a certain Michel Eugène Chevreul – and he’s a notable unknown in that he gave us the name of what is today perhaps the most familiar biological chemical – after DNA, of course. Although Chevreul came up with the name (in 1815) it was another Frenchman, François Poulletier de la Salle who, in 1769, first extracted the stuff from gallstones. The ‘stuff’ has turned out to be essential for all animal life. It’s present in most of the foods we eat (apart from fruit and nuts) and it’s so important that we actually make about one gram of it every day to keep up our total of some 35 grams – mostly to be found in cell membranes and particularly in the plasma membrane, the outer envelope that forms the boundary of each cell. 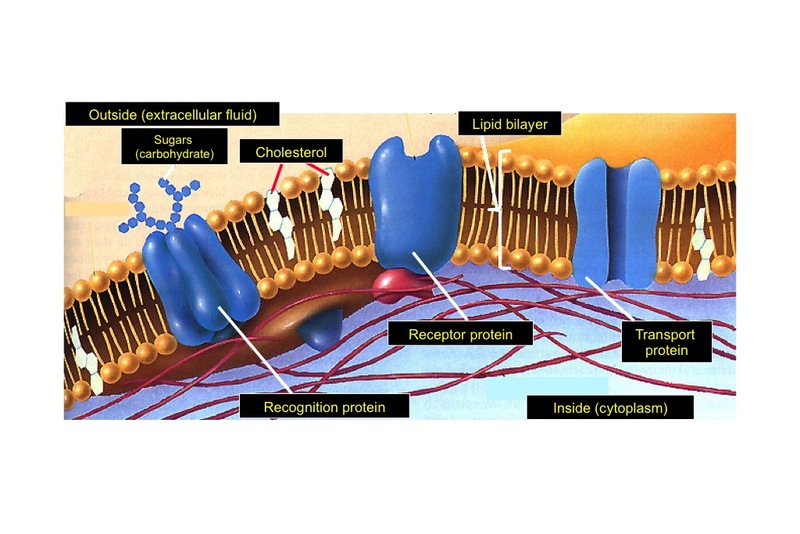 The cell membrane protects the cell from the outside world but it also has to allow chemicals to get in and out and to permit receptor proteins to transmit signals across the barrier. For this it needs to be flexible – which why membranes are formed from two layers of lipids back-to-back. The lipid molecules have two bits: a head that likes to be in contact with water (blue blobs in picture) to which is attached two ‘tails’ ­– fatty acid chains (fatty acids are unbranched chains of carbon atoms with a methyl group (CH3–) at one end and a carboxyl group (–COOH) at the other). The lipid ‘tails’ can waggle around, giving the plasma membrane its fluid nature and, to balance this, membranes contain roughly one molecule of ‘stuff’ for every lipid (the yellow strands in the lipid bilayer). As you can see from the model of the substance found by de la Salle, it has four carbon rings with a short, fatty acid-like tail (the red blob is an oxygen atom). This enables it to slot in between the lipid tails, strengthening the plasma membrane by making it a bit more rigid, so it’s harder for small molecules to get across unless there is a specific protein carrier. The plasma membrane. A fluid bilayer made of phospholipids and cholesterol permits proteins to diffuse within the membrane and allows flexibility in their 3D structures so that they can transport small molecules and respond to extracellular signals. De la Salle’s ‘stuff’ has become famous because high levels have been associated with heart disease and much effort has gone into producing and promoting drugs that reduce its level in the blood. This despite the fact that numerous studies have shown that lowering the amount of ‘stuff’ in our blood has little effect on mortality. In fact, if you want to avoid cardiovascular problems it’s clear your best bet is to eat a Mediterranean diet (mostly plant-based foods) that will make no impact on your circulating levels of ‘stuff’. By now you will have worked out that the name Chevreul came up with all those years ago is cholesterol and it will probably have occurred to you that it’s pretty obvious that our efforts to tinker with it are doomed to failure. We’ve known for along time that if you eat lots of cholesterol it doesn’t make much difference to how much there is in your bloodstream – mainly because cholesterol in foods is poorly absorbed. What’s more, because it’s so important, any changes we try to make in cholesterol levels are compensated for by alterations the internal production system. Given how important it is and the fact that we both eat and make cholesterol, it’s not surprising that quite complicated systems have evolved for carting it around the body and delivering it to the right places. These involve what you might think of as molecular container ships: called lipoproteins they are large complexes of lipids (including cholesterol) held together by proteins. The cholesterol they carry comes in two forms: cholesterol itself and cholesterol esters formed by adding a fatty acid chain to one end of the molecule – which makes them less soluble in water. adding a fatty acid to cholesterol. So famous has cholesterol become even its taxi service has passed into common language – almost everyone knows that high-density lipoproteins (HDLs) carry so-called ‘good cholesterol’ (back to the liver for catabolism) – low concentrations of these are associated with a higher risk of atherosclerosis. On the other hand, high concentrations of low-density lipoproteins (LDLs) go with increasing severity of cardiovascular disease – so LDLs are ‘bad cholesterol’. What’s this got to do with cancer? The evidence that cholesterol levels play a role in cancer is conflicting. A number of studies report an association between raised blood cholesterol level and various types of cancer, whilst others indicate no association or the converse – that low cholesterol levels are linked to cancers. However, the Cancer Genome Atlas (TCGA) that profiles DNA mutations and protein expression reveals that the activity of some genes involved in cholesterol synthesis reflect patient survival for some cancer types: increased cholesterol synthesis correlating with decreased survival. Perhaps that accounts for evidence that the class of cholesterol lowering drugs called statins can have anti-tumour effects. In a recent development Wei Yang and colleagues from various centres in China have come up with a trick that links cholesterol metabolism to cancer immunotherapy. They used a drug (avasimibe) that blocks the activity of the enzyme that converts cholesterol to cholesterol ester (that’s acetyl-CoA acetyltransferase – ACAT1). The effect of the drug is to raise cholesterol levels in cell membranes, in particular, in killer T cells. As we’ve noted, this will make the membranes a bit more rigid and a side-effect of that is to drive T cell receptors into clusters. One or two other things happen but the upshot is that the killer T cells interact more effectively with target tumour cells and toxin release by the T cells – and hence tumour cell killing – is more efficient. The anti-cancer immune response has been boosted. Remarkably, it turned out that when mice were genetically modified so that their T cells lacked ACAT1, a subset of these cells (CD8+) up-regulated their cholesterol synthesis machinery. Whilst this seems a paradoxical response, it’s very handy because it is these CD8+ cells that kill tumour cells. Avasimibe has been shown to be safe for short-term use in humans but the genetic engineering experiments in mice suggest that a similar approach, knocking out ACAT1, could be used in human immunotherapy. Yang, W. et al. (2016). Potentiating the antitumour response of CD8+ T cells by modulating cholesterol metabolism. Nature 531, 651–655. Dustin, M.L. (2016). Cancer immunotherapy: Killers on sterols. Nature 531, 583–584.